Kosaka House (小坂家住宅) is one of the remaining Edo style house in Mino. This house was built in Edo period, and designated as national important cultural asset. It has very unique roof, the curve shape roof. The inside of shop are still the same as the original house. Kosaka House is also established Sake Brewery. Hakyu shun is their popular brand. You can see the inside of house, but do not entire the restricted area. Architectural feature of this building: National Important Cultural Asset. 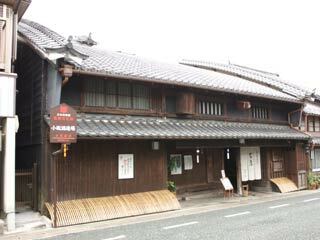 This house was built by Kosaka Family, wealthy merchants who have been making Sake for generations. This building has a unique arch shaped roof. This, and the fact that Edo architectural style is retained throughout the house's construction, from the front main building to the Sake brewery at the back, makes the house invaluable. While some interior parts were remodeled in the Meiji era, the beautiful Edo appearance to the house has been well preserved and is exemplified i the shop counter and fixtures. The house is a designated national important cultural asset.